AMERICAN President Barack Obama stressed the “sense of urgency” needed to confront the global economic crisis in talks with Gordon Brown ahead of the G2O summit of world leaders in London. But outside the sealed-on conference centre in London’s Docklands anti-capitalist protesters clashed with the police in the financial centre of the capital while angry French workers in Grenoble seized control of their plant offices taking four managers hostage. Brown hoped to use the summit he called to build a common imperialist platform of measures to deal with the global slump. But it was unravelling before it even started with Franco-German imperialism demanding stricter international financial regulation and decidedly cool towards the Anglo-American ’monetarist’ economic model, which they blame for the sub-prime crisis that triggered the great stock market crash last year. The British Government wants China to pump vast sums of money into the international financial institutions of capitalism in return for more votes on the International Monetary Fund and the World Bank while Third World leaders want reform of the World Trade Organisation which has been dominated for far too long by American imperialism. President Obama said that the world was facing the most severe economic crisis since the Second World War. me new chief of American imperialism called on the G2O to reject protectionism and support emerging markets, and called for countries to work together. This was dutifully repeated by Brown who said global solutions were needed for global problems while talking up Britain’s imaginary “special relationship” with the United States, which he said,would be a “partnership of purpose”. In public the Western leaders are trying to talk up the markets with their usual platitudes. In private there’s no doubt that they have little up their sleeves apart from letting the slump take its course peppered with a touch of social Keynesianism to sweeten the bitter pill of austerity for the working class that they expect, as always, to pay for the crisis of the exploiters’ own making. But there’s also increasing fear of political crisis and uncontrollable Athens-type social unrest as protests against job and welfare cuts sweep Europe. The reactionary Czech government collapsed last week after four maverick MPs joined the opposition Social Democrats and Communists in a vote of no confidence in parliament. And French bosses got a warming of the shape of things to come when four of them were seized by workers at the Caterpillar factory in Grenoble. “We are holding them in the director’s office” , union official Benoit Nicolas told the media. The hostages included the factory director and the head of human resources. “ they are a little shocked,” Nicolas said. The workers at the American plant walked out and took direct action on Tuesday following the news of over 700 lay-offs on pitiful redundancy terms. The Caterpillar workers are demanding a minimum of 30,000 euros [£27,8OO] each in redundancy payments three times what’s on the table at the moment. “Bossnapping” is a French workers’ tradition which was popular during the wave of protests back in 1968. Last March the boss of Sony France was trapped in a conference room by workers demanding better severance terms and the head of a factory run by 3M, the giant American multinational, was held for two days by striking workers . The Grenoble region has been hit by a wave of factory closures, re-structuring, and temporary lay-offs and the spirit of resistance is running high. French workers rightly say that if there’s money to bail out the banks then some of it must be used to keep manufacturing going and that money could come from the European Globalisation Adjustment Fund. While top executives continue to fill their boots with bonuses, like in Britain, more and more French workers are being given their cards. Some 2.4 million are unemployed now and it can only get worse. No amount of tinkering with the capitalist system can halt the slump which will crucify working people unless they fight back. Communists and the unions must move into an organised counter-attack across Europe and the world to defend the working class and build the fight for socialism. WORKERS, students and pensioners marched through the streets of London last Saturday to send a message on jobs, justice and climate to Gordon Brown and the G2O leaders meeting in the capital this week. Tens of thousands of people, including a many union contingents, took part in the protest which passed over peacefully, despite lurid predictions of anarchist violence emanating from the police and the reactionary press over the past few days. Threatening to “eat the rich” may be inspired by the spirit of Michael Bakunin and Peter Kropotkin but it’s hardly in the same league as the anarchist terror of the 19th century which claimed the lives of a Russian Czar, the kings of Greece and Italy, an American and a French president, a Spanish prime minister and many others with their daggers, guns and bombs. Smashing the windows of a hated former Scottish bank boss may give the perpetrators some sort of feeling of power and importance but it accomplishes nothing apart from unleashing a wave of hypocritical condemnation from a bourgeois media that routinely ignores the daily racist abuse and violence on our streets. The Group of 2O summit will include the leaders of People’s China, Indonesia, Brazil and Saudi Arabia but it will be dominated by American, British and Franco-German imperialism. 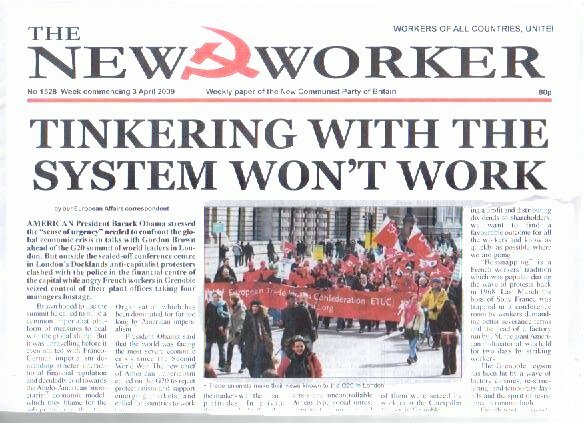 Whatever the great and the good of the G2O decide at their secret conclave in London’s Docklands to deal with the world-wide slump, there’s no doubt that the imperialism will want to make working people pay the price for the “recovery” they say is on the horizon. And we will be expected to bear the brunt of the capitalist crisis in mass unemployment, welfare cuts and short time to ensure that the rich continue to live their lives of pleasure and ease unscathed. Resistance is growing throughout Europe and the rest of the world and the unions have a crucial role in setting the agenda for the fight-back against this new offensive against the working class. Communists must fight to ensure that the socialist alternative is once again raised in the factories, offices and streets of Britain. It is the only answer to the crisis. ANOTHER shameful chapter in the history of British imperialism ended this week with the withdrawal of the last British military contingent in Iraq. The flag came down this week and most of the garrison will be gone by the end of May, though a few hundred military advisers will remain to train the Iraqi puppet army. Significantly, the Marine base at Basra aiport was not handed over to the puppet authorities but to the Americans, whose occupation army is still needed to prop up the “Green Zone” government in Baghdad. We are now told that the British occupation of sou them Iraq was a “peace-keeping” mission that was accomplished with dedication, commitment and courage. Nothing is said about the killing and torture of Iraqi civilians over the past six years or the opposition within the army to the futility of the mission in the first place. It’s an old story repeated over the years in Ireland, Kenya, Egypt, Cyprus and Aden. Popular resistance has taught imperialism no end of a lesson throughout the 20th century. The waste of lives, including those oft he hapless squaddies sent to crush popular resistance, carries on in Afghanistan today. The anti-war movement which mobilised millions against the Iraq war must continue to ensure that it never happens again.